Polish Nobel laureate Władysław Reymont, with his Revolt, anticipated by two decades Orwell's Animal Farm. Gulliver's Travels, a favourite book of Orwell's—Swift reverses the role of horses and human beings in the fourth book—Orwell brought also to Animal Farm "a dose of Swiftian misanthropy, looking ahead to a time 'when the human race had finally been overthrown.'" 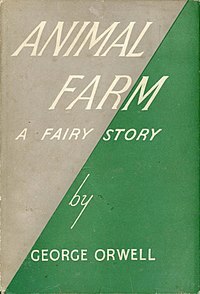 White Acre vs. Black Acre, published in 1856 and written by William M. Burwell, is a satirical novel that features allegories for slavery in the United States similar to Animal Farm's portrayal of Soviet history. George Orwell's own Nineteen Eighty-Four, a classic dystopian novel about totalitarianism.